The National Heart, Lung and Blood Institute has awarded an OMRF scientist $5.9 million to study new ways to control bleeding like that which occurs in aneurysms. OMRF researcher Courtney Griffin, Ph.D., received a seven-year grant to pursue novel research into blood vessel function and factors that lead to uncontrolled bleeding. The grant was awarded under a new federal granting program known as the R35, which was established to promote scientific productivity and innovation by providing sustained support and increased flexibility in research. NHLBI program officer Yunling Gao, Ph.D., said the R35 award is designed to provide long-term support to outstanding investigators like Griffin who are conducting research that breaks new ground or extends ongoing studies that are making significant contributions to the field. Griffin’s work is focused on proteases—proteins that chew up other proteins. 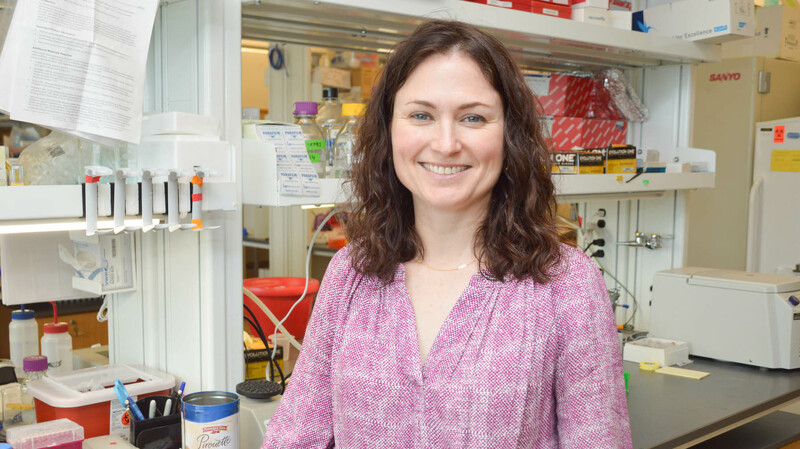 At OMRF, she studies the role proteases play in a healthy setting and also the damage they can cause in blood vessel development when they go awry. When blood vessel integrity is compromised, they become weaker and can rupture, which can be fatal. By knowing what vessels are susceptible and under what conditions, they can identify disease links that may be predictable and lead to the development of therapeutic interventions. The grant, No. R35 HL144605, is from the NHLBI, a part of the National Institutes of Health.